The Office of Defects Investigations (ODI) analyzed complaint data provided by Ford as well as complaints submitted to ODI from consumers. In total, there were 364 unique reports indicating various shift quality issues while driving. Ford identified several factors that may contribute to shift quality concerns in the subject vehicles, including cold transmission, clutch stay-out at high engine speeds, gear clash or grinding, and gradual loosening of clutch plate bolts in some early production vehicles. The largest percentage of complaints indicated higher than expected shift efforts in cold ambient temperatures. These complaints were related to transmission fluid viscosity and the higher shift efforts resolved themselves with the drivetrain warming. Ford published technical service bulletin TSB 11-3-18 to inform technicians that a lower viscosity fluid was available for use to address the cold shift issues. The clutch stay-out condition typically occurs at engine speeds greater than 4000 rpm. It does not prevent the selection of any gear, but may delay clutch re-engagement depending on how long the driver maintains the higher engine speed. Ford identified rotating inertia of the clutch components as the root cause and replacement clutch pedal parts were made available under Ford TSB 10-19-4. A number of reports alleged increasing difficulty selecting gears along with gear clash or grinding. Grinding or notchy gear shifts may be caused by gradual loosening of clutch plate fasteners, which is promoted by certain aggressive shifting. This condition is progressive in nature and initially results in symptoms related to shift quality/feel. Clutch plate bolt loosening will not result in inability to select any gear unless the progressive symptoms are ignored until complete clutch failure occurs. ODI’s analysis identified only five complaints alleging an inability to shift into gear due to loose clutch plate bolts. None of these resulted in a stall and gear shifting could occur before engine start. A revised fastener was designed and implemented in production and is available for service through a special service message. There is no indication of loss of motive power or unreasonable safety risk associated with the alleged defect in the subject vehicles. This preliminary evaluation is closed. 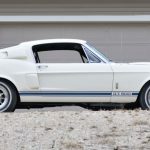 This entry was written by by MustangsDaily (Mustangs Daily) and posted here on Tuesday, December 20th, 2011 at 2:34 pm and is filed under mt-82 6-speed transmission, mt-82 transmission, mt-82 transmission problems, mustang transmission problems, News, nhtsa. This article was not written by us, rather gathered using RSS feeds listed here. We take no credit for this article. You can leave a response, or trackback from your own site.